A few weeks back, while clearing out her family home, a lady named Peggy Farrington came across an unusual small, white, round, stitched object. It was a baseball, unused, but clearly on the older side. Working out how it got there was not too tricky. Peggy’s late father had been sent a wide range of samples in the early stages of a career in sports education, and thus the fact this item had come into his possession was not odd. That he’d kept it, however, was surprising, since he’d passed almost everything else sent his way straight onto a school. His keeping hold of this possession suggests it had some significance to him. It is probably for this reason that Peggy, rather than giving it — along with many other items in the clearance — to a charity shop (where it could have been purchased by an experimental dog owner and ended up gnarled and underneath some bush in a park), decided to see if anyone might be interested in giving it a good home. Peggy contacted BaseballSoftballUK, who put her in touch with the British Baseball Federation, which in turn led to me being brought into the discussion. 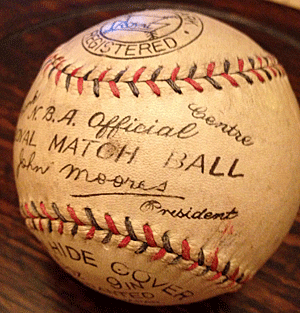 Two words, in particular, from Peggy’s description of the ball caught my eye: “John Moores”. A photo, shown to the right, confirmed my hopes that this was a ball from British baseball’s “golden era” of the 1930s. This is a period of the game from which very little in the way of artefacts, except for programmes, has survived. Peggy has now kindly donated it into my safekeeping. What’s perhaps more interesting than the ball itself is the story of its previous owner, Peggy’s father Gordon. I present this below, adapted only very slightly from Peggy’s words. T Gordon Davies (1909-89) was born in Loughor, South Wales. His father died when he was 18 and so his ambition of attending university was abandoned in favour of becoming the bread-winner for his mother and three sisters. He had always had a passion for sports and became and accomplished athlete, gymnast, rugby player and swimmer. In fact there was hardly a sport in which he did not excel. He trained in PE at Carnegie College (Gordon is pictured left during his time there), trained troops in unarmed combat, lectured at Loughborough College, taught at various schools and became Senior Adviser for Education with Glamorgan County Council. 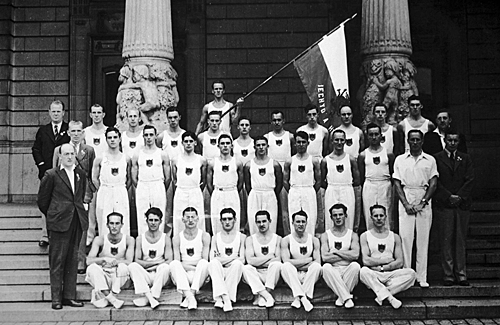 One of his many honours was captaining the Welsh team at a world gymnastics festival in Stockholm in 1939 (pictured below, with Gordon second from the right in the second row), which was held to commemorate the 100th anniversary of the death of Pehr Hendrick Ling, a man credited with developing physical drill in Sweden. 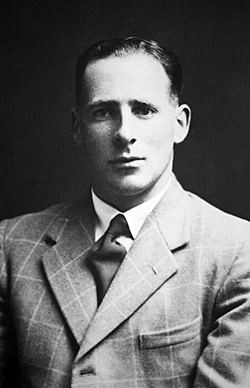 One of the policy’s championed by Gordon in Glamorgan schools was for rugby union to be the sole instructed sport. Subsequently, with many of the players of the great Welsh rugby team of the 1960s coming from Glamorgan schools, it can certainly be viewed to have paid off. Gordon was a brilliant raconteur who was well-loved by colleagues and who continues to be very much missed by his remaining family.